Imaginary Sunshine » Could you have said no to them? Could you have said no to them? I got these two cuties from my entomology professor during the lab today. Anyone who was doing the insect collection could get one or two, if you weren’t doing the insect collection, you could get one as well. Also, my professor’s trying to encourage us to keep these stick insects alive, so all we have to do identify the Family and Order without pinning them for our insect collections (hello, another Order for my collection!). They’re quite small, but I’ve already been able to tell some behavioural differences between the two of them. One of them (the one with that little bulge, which I believe is the part that remains from the egg casing, on the tail) is a lot more active than the other (has the remaining part of the egg casing on a metathoracic leg). I currently have them in a very makeshift home – glass gar, tulle that’s over the opening with a rubber band, a stick that I cleaned off and a few blackberry leaves that were washed off and left a little damp so they can have some water as well. Haha that’s neat! Your professor giving gifts and all 😛 I could never take that course in a million years, on account of my bug phobia, but it sounds fun! I think that was more geared towards ‘pest’ type of insects 😉 My mom’s cool with it, after I told her that my professor gave them to me! Wow that is so cool! I’m glad your parents weren’t upset with your new little creatures! 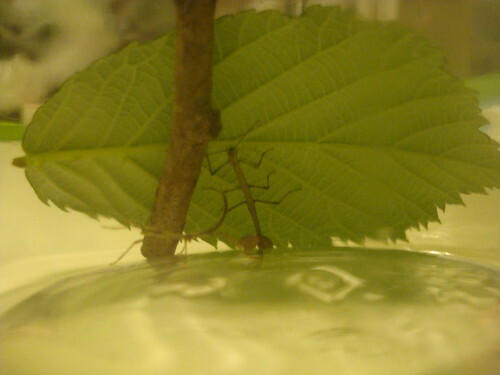 It helps that stick insects don’t destroy homes, that was their main concern. Haha, thats nice. I actually did that too. I bought some mice from an auction site without telling my mum and ironically she was the one who went and picked them up heh. They were my first pets as well.